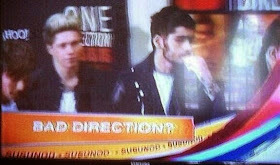 Manila, Philippines - Fans of British group One Direction react to GMA-7 report tagging 1D as 'Bad Direction' in one of its news programs. The hashtag '#BiggestLiesGMA' trended worldwide on Thursday, May 29, 2014 as netizens support the popular boyband. GMA News tagged the group 'Bad Direction?' due to the viral news and leaked video obtained by Daily Mail that says that One Direction members Zayn Malik and Louis Tomlison were smoking a suspicious looking self-rolled cigarette allegedly a 'marijuana'. 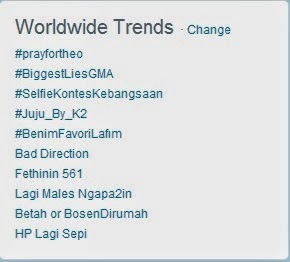 On microblogging site Twitter, majority of netizens defended the 1D members and reiterated the good deeds of the boyband specially during super typhoon Yolanda. Some say that One Direction is active in helping out organizations including Alzheimer's Association, Comic Relief, Green Peace, Mines Advisory Group, Sport Relief and other charities. Meanwhile, some irate fans said they are going to destroy or sell tickets for the upcoming concerts of the British boyband. 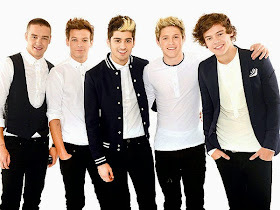 One Direction has developed loyal following worldwide after its members became part of UK's X-Factor in 2010. The band is consistently topping US Billboard Top 200 chart and has videos on Youtube, which already garnered hundreds of millions total views. The band is scheduled to have a concert in Manila on March 25, 2015.